To succeed in business today, an individual must be smart, competitive, resilient, tenacious, and fearless. In short, he or she needs a good, old-fashioned backbone. 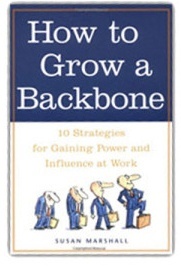 In How to Grow a Backbone, Susan Marshall, a top business consultant and former executive, outlines skills that readers can develop and perfect to become stronger, more confident, and more influential on the job. Often regarded as a classic guide to professional development. You will learn the proven 10 Strategies for Gaining Power and Influence at Work. Do not miss out on this! Using straight talk laced with wry humor, the author draws upon actual business situations from a variety of companies and industries to show how a strong backbone can change not only the outcome of the situation, but also how one is perceived.